KinemeCore 0.5 is a massive reorganization of KinemeCore. Improvements were made with stability, performance, memory usage, and Snow Leopard compatibility. Several new features were added as well. Extra Editor -- Ever wish you could have more than 1 editor per composition? Now you can with KinemeCore's Extra Editor, making macro editing a breeze. PlugIn Installation Assistant -- Does it go in Quartz Composer Patches or Quartz Composer Plug-Ins? The KinemeCore PlugIn Installation Assistant knows the answer, and will install the plugin to the correct location by simply double clicking the plugin in Finder. Farewell, incorrectly installed plugins. The new PlugIn Manager panel can inspect your plugins for obsolete, incorrectly installed, or duplicate plugins. It can also try to fix these problems with a single click. Linear Noodles -- declutter your compositions with Linear Noodles, and enjoy a slightly more responsive editor too. Or just go for a different look to impress your friends. "QTZInfo inside" -- Our Spotlight importer(QTZInfo) is now bundled with KinemeCore, and can be enabled with the click of a mouse. QTZInfo inspects every note, patch, and port of your composition to help you find it via Spotlight. The Editor Status panel lets you inspect QC's current memory usage and thread count (to help spot leaks and runaway threads before it's too late), and also indicates if QC is running in 32 or 64 bit mode. It's also equipped to show you if the QC Editor has Automatic Garbage Collection enabled -- it isn't now, but it could be someday in the future. Experimental Macro Patch Transmutation -- modify your macros without breaking noodles. 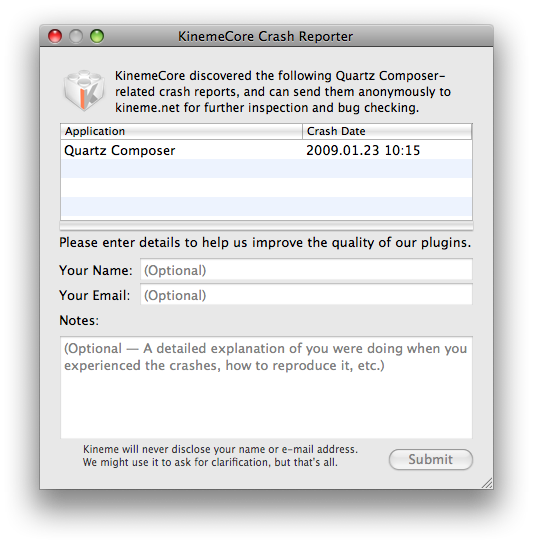 This release of the KinemeCore plugin fixes numerous bugs with Snow Leopard compatibility. Not too many additional features, just some fixes to get everyone back up and running. This update to KinemeCore adds pause/step functionality, a rewritten preference pane, and publish/split-by-selection functionality. It also fixes a bug where the crash reporter would sometimes forget to record sent crash reports, leading to duplicates. It does not fix the editor-on-top confusion nor alternative noodle drawing. This update to KinemeCore fixes the transparency bug, some publish to root bugs, attempted output publishing in consumer macros bug, and cleaned up the about box to help identify versions easier. This update to KinemeCore fixes some reliability issues with the crash reporter submission window, adds Publish To Root functionality, and auto-spaces splitters to look nice and pretty. In the words of Wil Shipley: "And that's how we pimp it up in my house, nerds and nerdettes." Have a lot of fun! This beta to KinemeCore adds Publish All Inputs/Outputs, and Splitter To/From All Inputs/Outputs functionality in the right-click menu.